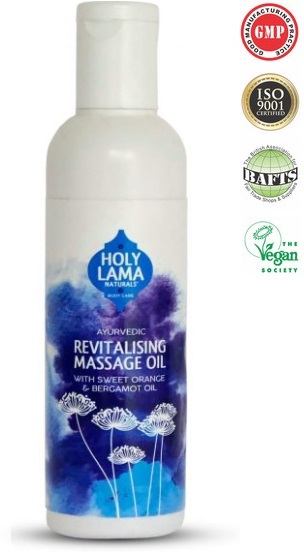 This Revitalizing Fair Trade massage oil by Holy Lama Naturals is an Ayurvedic massage oil made with a blend of sesame, coconut, almond, jojoba base oils, and a carfull blended selection of bergamot, lemon, orange and lemongrass pure essential oils. Use this revitalizing body massage oil with its citrus tones as an everyday all over body oil to help nourish, calm and revitalise your body and mind. Ingredients: INCI: Helianthus Annuus Seed Oil, Sesamum Indicum Seed Oil, Cocos Nucifera Oil, Prunus Amygdalus Dulcis Oil, Simmondsia Chinensis Seed Oil, Tocopherol, Cymbopogon Schoenanthus Oil, Citrus Limonum Fruit Oil, Citrus Aurantium Dulcis Oil, Citrus Bergamia Fruit Oil, D-Limonene, Citral, Farnesol, Linalool, Geraniol, Citronellol.